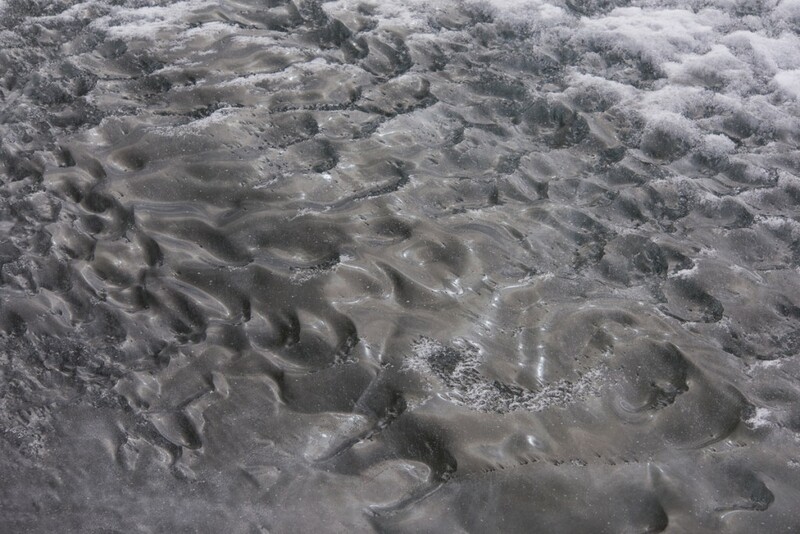 This bumpy ice at the edge of one of the inland lakes at Cape Royds looked like flash-frozen oblong bubbles. For my Antarctic Artists and Writers Program project, I expected to be photographing glaciers and large ice formations, but once I got to Cape Royds and the Dry Valleys, I also discovered some small scale — even tiny — ones that fascinated me in their variety and the unexpected shapes or colors. 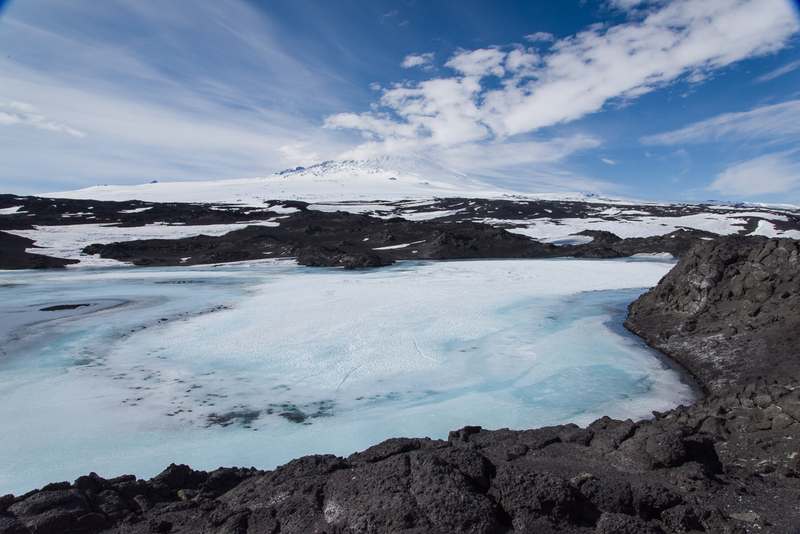 It seems that the extreme cold of Antarctica generates some peculiar ice formations in the freshwater lakes fed by glaciers. 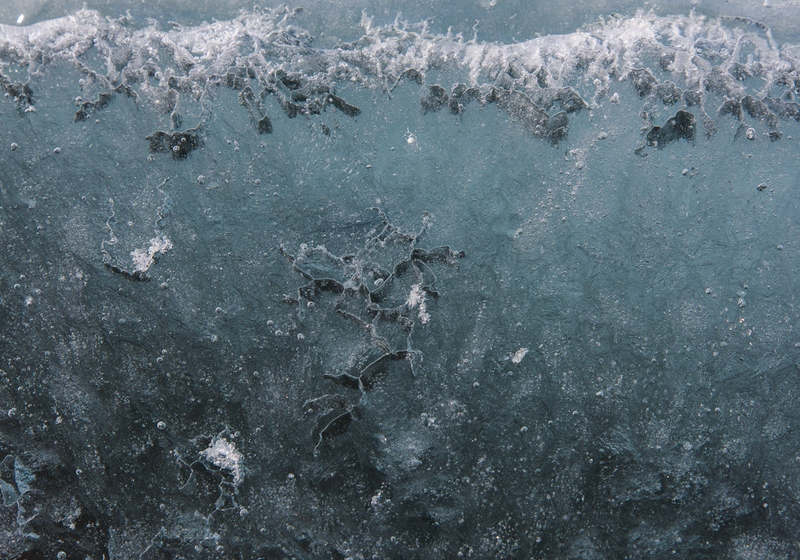 Looks like waves lapping on the lake shore, but they’re completely frozen. 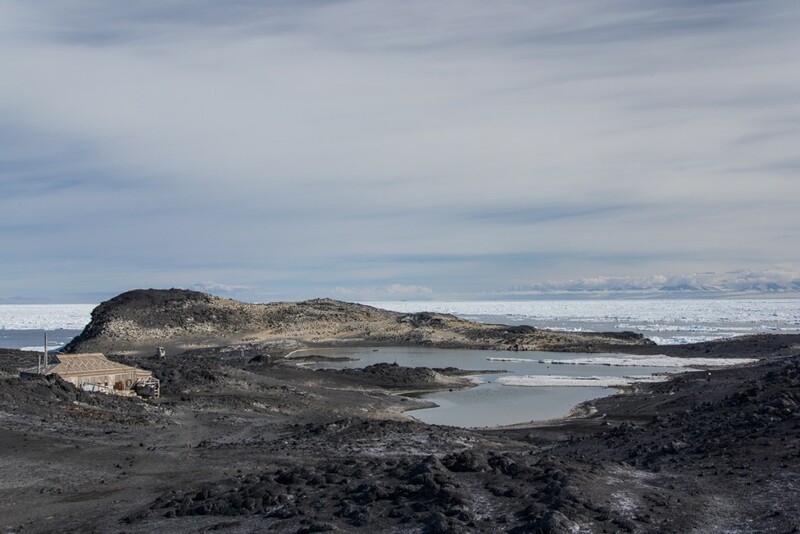 One of the large lakes at Cape Royds. Mt. Erebus is in the distance. The first couple of days I was there, the lake was frozen and you could walk right onto it from the shore and cross to the middle. That’s when I took these photos. But a couple of days later, the edges had thawed and there was no way to get to the ice without wading across a few feet of water. Some of these lakes melt around the edges this time of year (December-January), but never thaw completely. I don’t know if the kind of ice formations you’ll see in the photos that follow are found elsewhere in other places that are cold much of the year, for example, the Arctic. 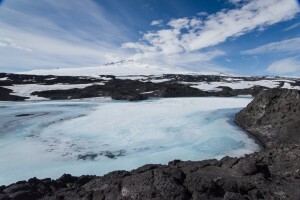 Nobody I’ve asked so far could tell me, but then again, most people who are working in those places as mountaineer guides or researchers aren’t attending to that ice, except as a practical matter to check out if it’s safe to walk on it. So if anyone reading this has more information about what physical processes are causing these shapes, feel free to comment! 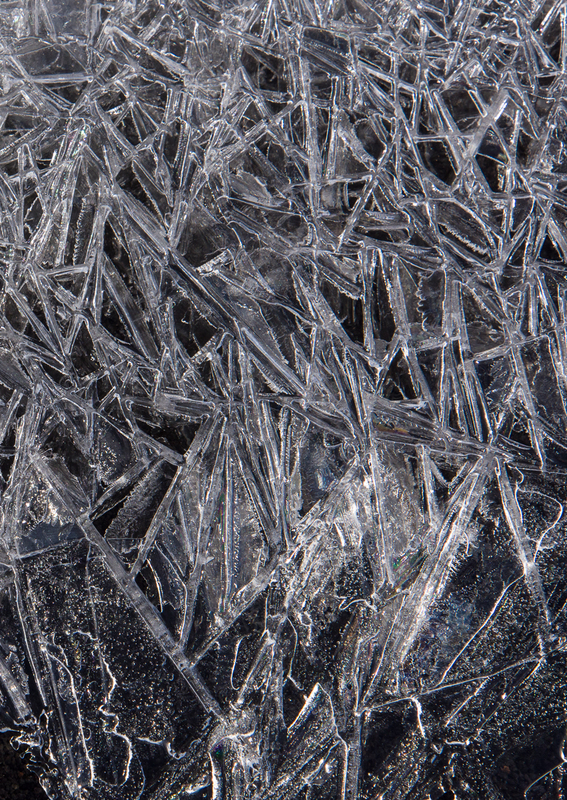 A close-up of a jagged ice pattern found walking along the black sand beach at Cape Royds. It’s pretty much all straight lines. 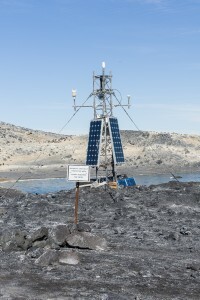 It also could be at Cape Royds that because of its proximity to the sea, there are salts in the water that are contributing to some of these effects. This cracking pattern at the left was not photographed at the lake, but at the edge of a black sand beach where there was a pressure ridge and sea ice. But snow was melting from a ridge above the beach so it’s hard to say if it’s frozen freshwater or frozen sea water or a combination. 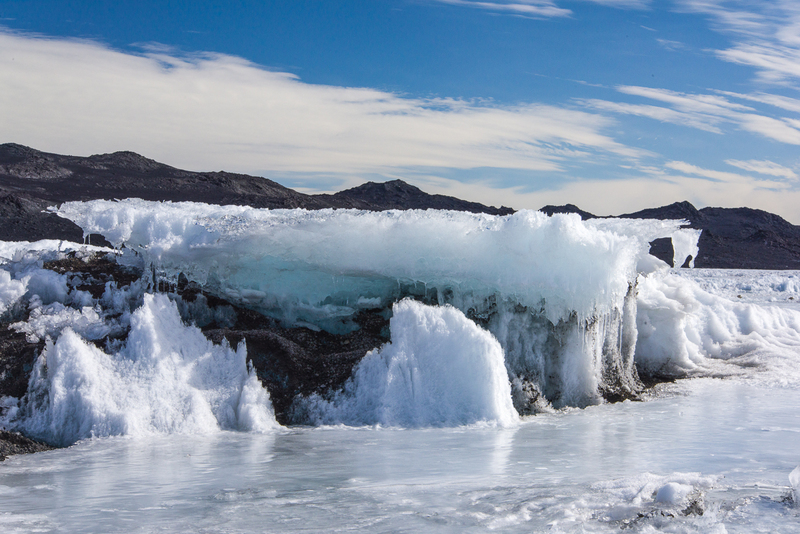 Ice structure in the middle of a lake at Cape Royds. The ice around it was thick and solid enough to walk on. 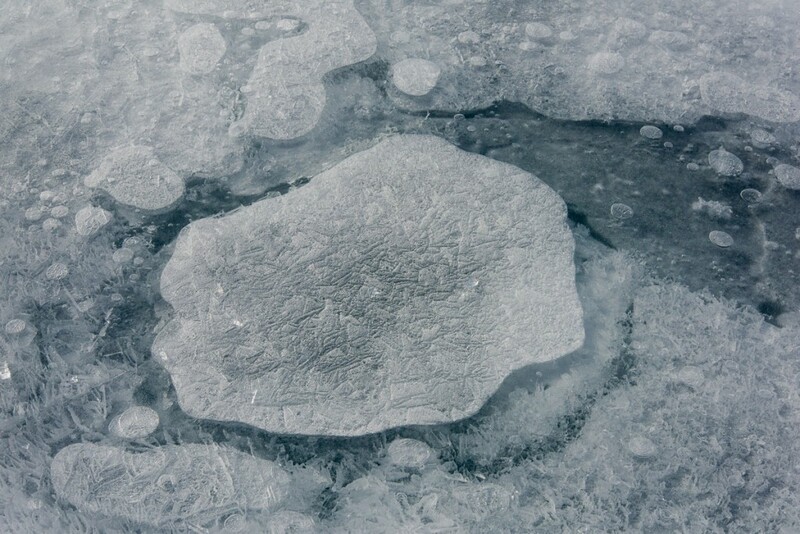 Some of the unusual patterns I found were at the center of one of the inland lakes at Royds, where gravel from the surrounding hills had blown onto the ice, piled up there, and there was a frozen flat-topped ice structure sitting on top of it. 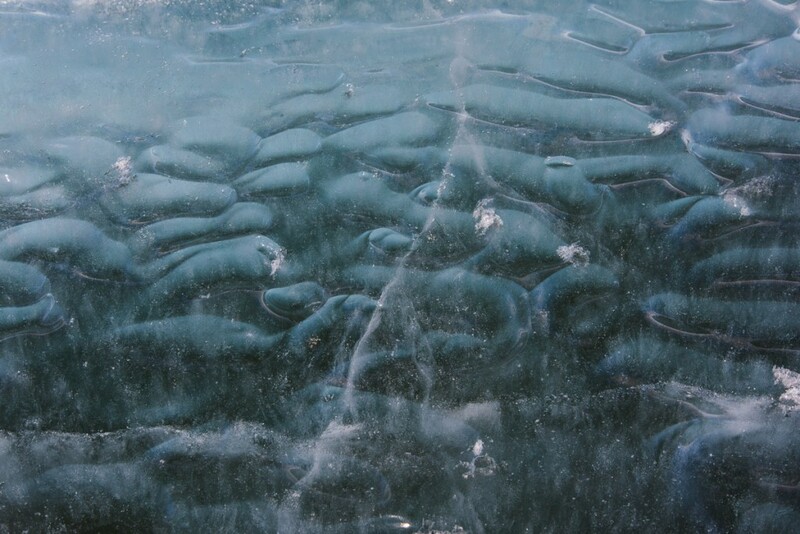 There were a lot of these isolated flat-topped ice structures at Lake Hoare in the Dry Valleys, too. 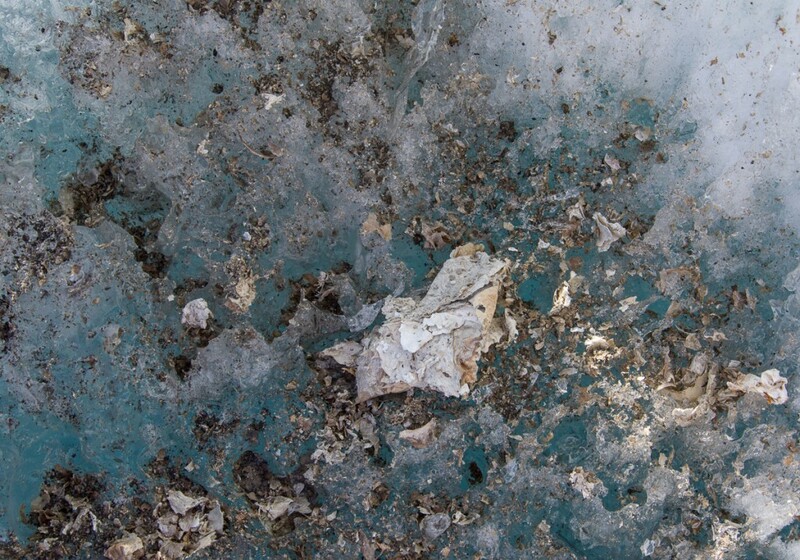 The ice designs I found at Lake Hoare will be the subject of a later blog post. The explanation I got at Hoare was that while the ice forms from the bottom (and in the Dry Valleys the lake ice is a few meters thick), the frozen surface of the lake ice ablates — that is, vaporizes into the air — but sometimes leaves areas that haven’t ablated still sticking up above the frozen lake surface. The next few photos were taken near one of those structures, shown in the above photo. It was probably about three feet high, several feet wide and extended for several feet in the middle of the lake. You can see in the photo there was a lot of sediment around it. This design, photographed near the formation shown above, has rounded shapes, within which are a combination of straight lines and curves. And it has distinct layers at different depths, presumably from freezing and melting and refreezing at different times. 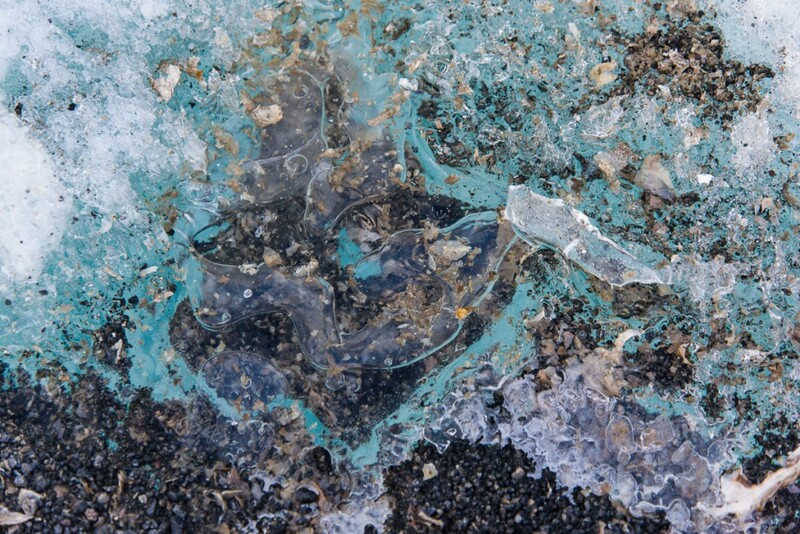 An algal mat “collage” in the lake ice. This one looks like someone splattered turquoise paint on it. You can see where gravel has blown onto the ice and piled up. The gravel melts holes in the ice, too. 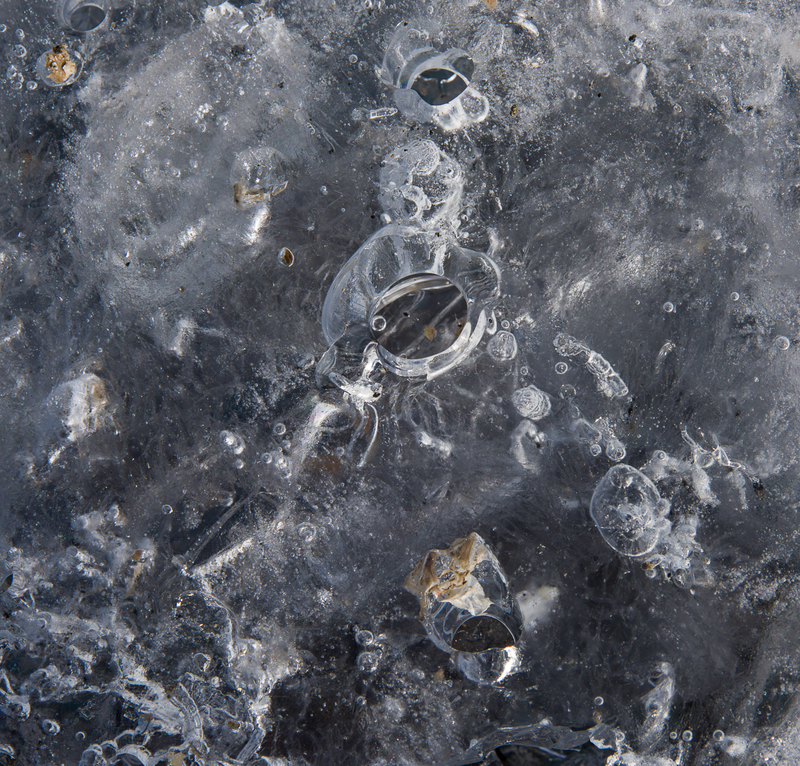 This microworld of a thick layer of ice on top of sediment has some scattered fragments of algal mat, frozen bubbles of varying size and holes. It was taken nearby the two photos above. 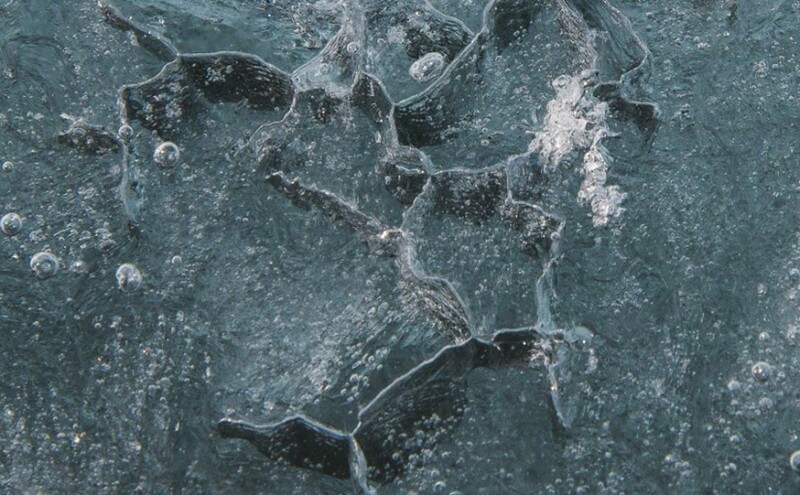 Ribbons in the ice: anyone know what causes these? I also saw similar patterns in Lake Hoare but the ribbons were not nearly as wide, nor were they colorful, just plain white. Detail of the ice ribbons. 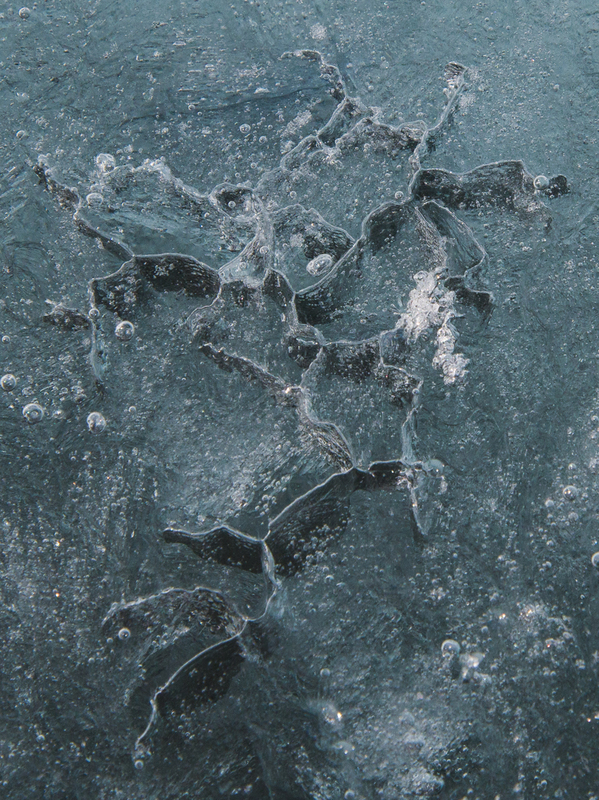 In a future post I’ll show some of the small surface ice formations from Lake Hoare, which were different than these. 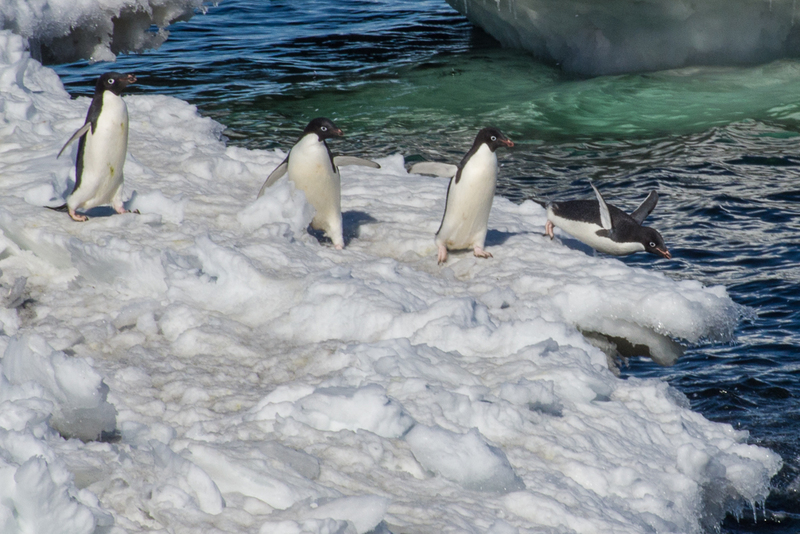 I’ve encountered much more variety of ice in Antarctica than I had expected, a happy discovery. 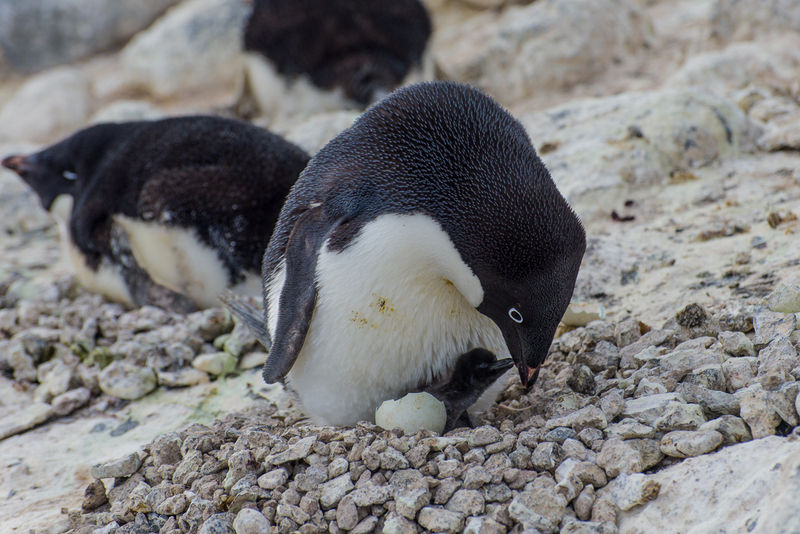 Newborn penguin chick — one of the first if not the first to hatch this season — greets its parent. I can’t believe my luck. I mean, really. 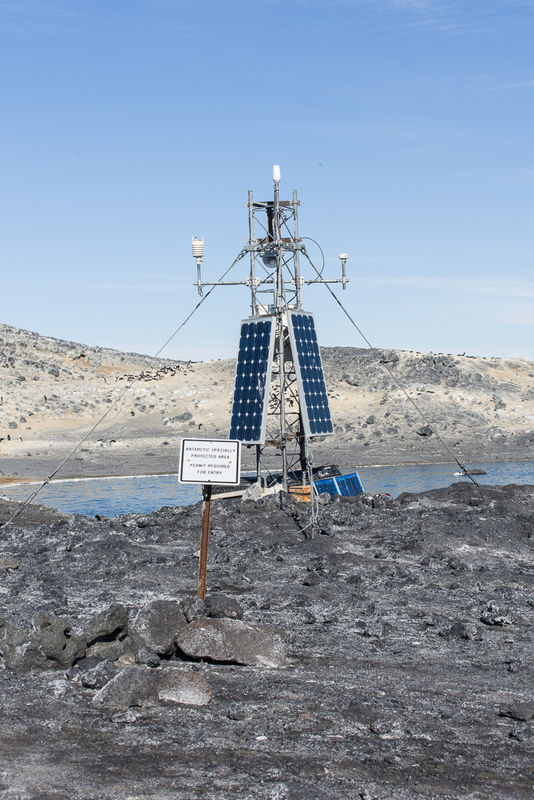 December 13th was my last full day at Cape Royds. It was overcast and the coldest day since I’d been at Royds and I had to keep stopping to warm up my hands. Not to sound melodramatic or anything, but I also had a cold and wasn’t feeling 100 percent. 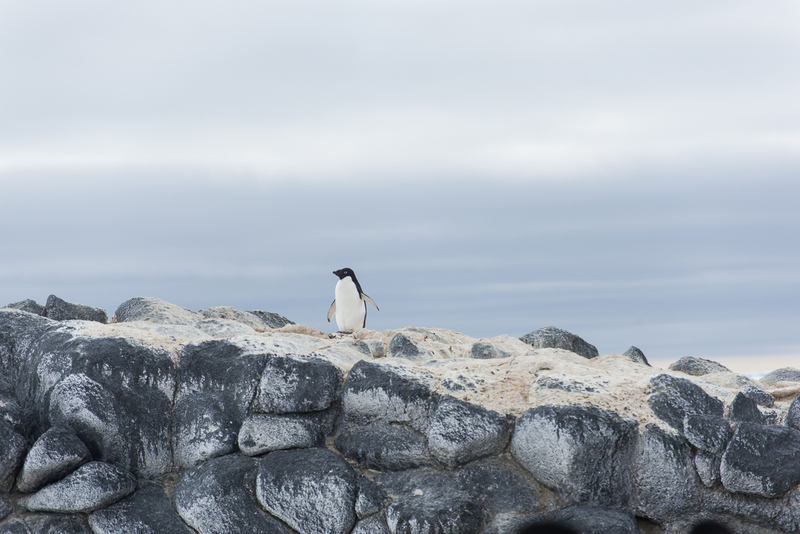 But I went out for a couple of afternoon walks with my camera and tripod anyway — one in the direction of the volcanic landscape, then after a pit stop at the field camp tent to warm up, one to the penguin colony. 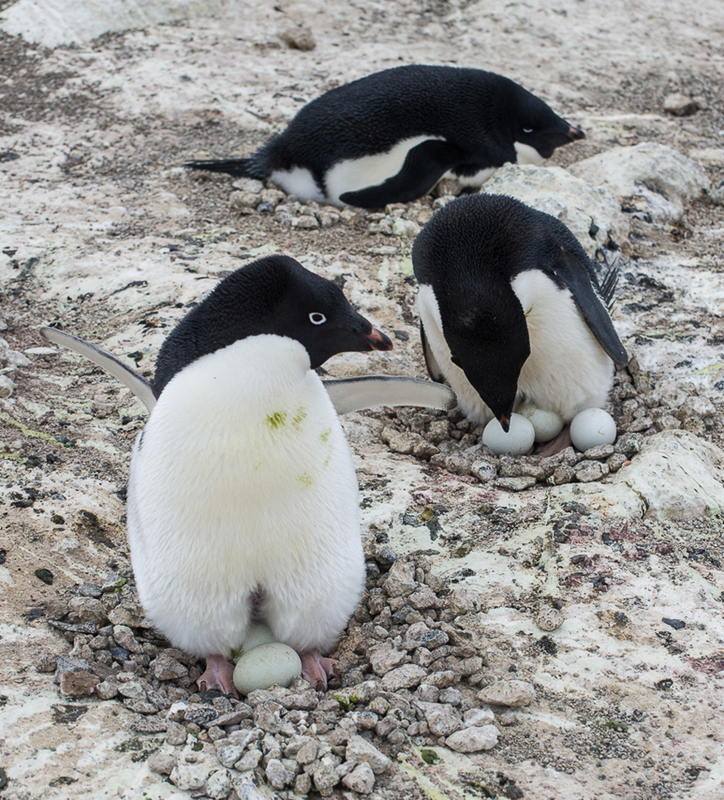 I have been told by the research team here that this is the time of year they typically see the first chicks. Nobody saw them yesterday, but Katie thought she heard a faint peeping and that there might have been some pecking their way out of their shells. Since I knew I would be getting picked up late morning the next day, I knew this would be my last chance to see chicks and I was on the alert for sounds. It started getting windy and I thought I heard something a couple of times but when I went over to investigate didn’t see anything. I wasn’t sure if it was my camera bag strap squeaking in the wind, which it does sometimes. After watching a colony that sounded like the direction it was coming from, I did catch a glimpse of an egg with a hole in it when a penguin stood up briefly and then settled back on top of it. But after waiting several minutes in the cold, I decided it wasn’t happening, my fingers were frozen and started walking in the direction of the path to the campsite. As I passed the neighboring subcolony, I heard an unmistakable peeping sound, looked to my left and saw this scene. It only lasted about 2 minutes — I took a few stills, turned on the video, and watched the penguin feed the chick and settle back down on it. You can see the video on YouTube. The subcolonies are distributed throughout the colony. Some have numerous nesting pairs, like this one, others only have a few. I saw one with just four nests. Mostly what I saw while I was here were behaviors related to nesting. 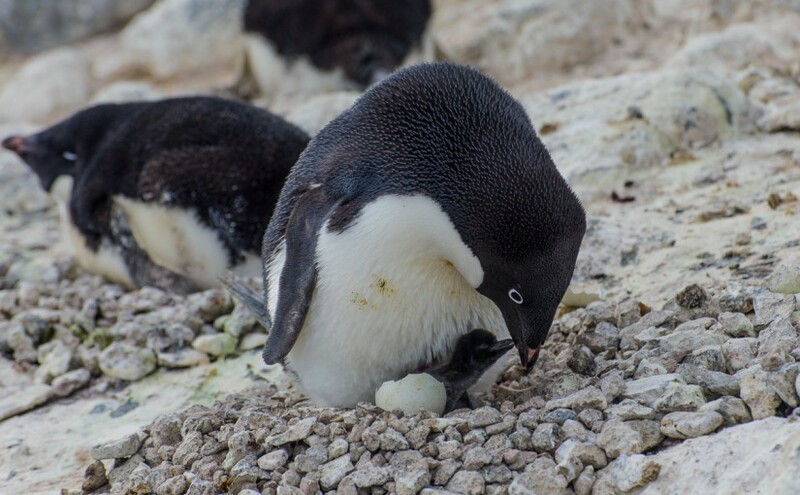 All the penguins who will breed this year have paired up, created little stone nests in their subcolony groups, and laid the eggs. 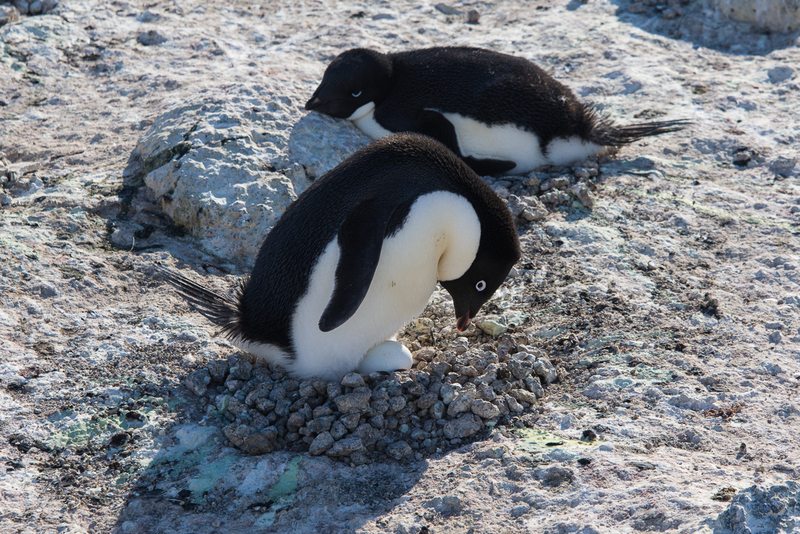 The male does most of the nest-building, but once the female lays the eggs, they trade places sitting on the eggs. One goes down to the water to forage for food while the other sits on the eggs. When the foraging penguin returns, they great each other with a little dance where they swoop their necks up and down in unison and call out loudly. Then they switch places and the other parent goes off to feed. 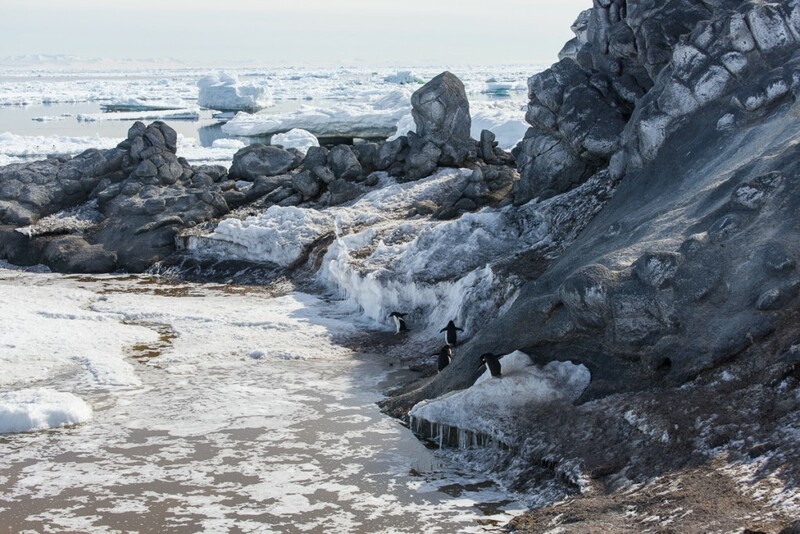 I was hanging out on the bluff overlooking the water watching the penguins form little groups to go in the water. They just go down there and join with others who happen to be on their way, and walk more or less single file. 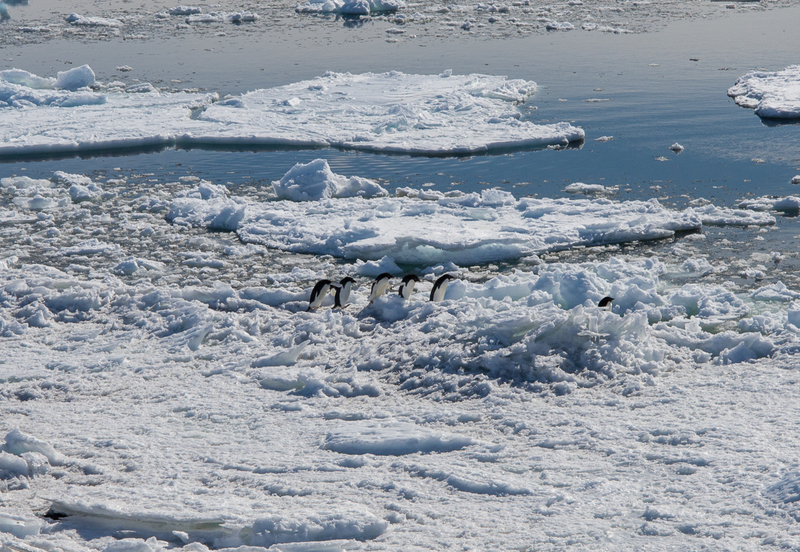 Penguins travel single file to the water to feed. 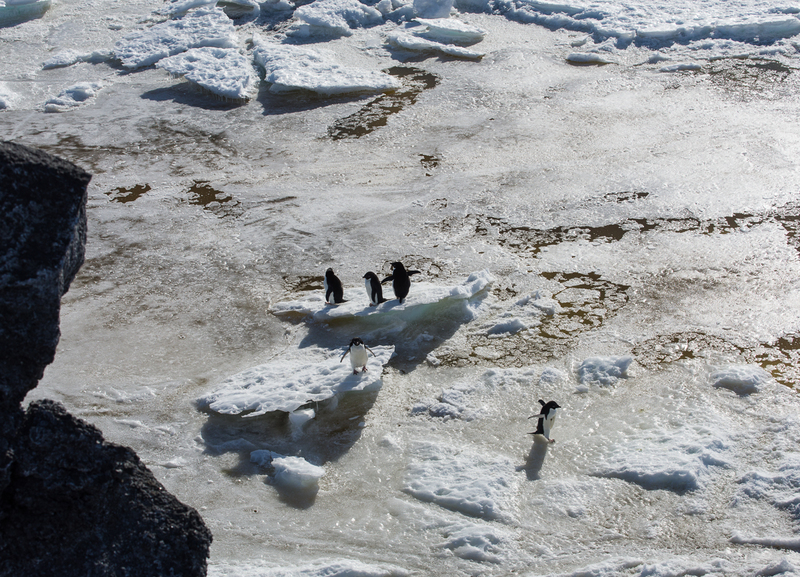 A lot of pack ice had blown in from the north, so they had to make their way across that to get to the water. 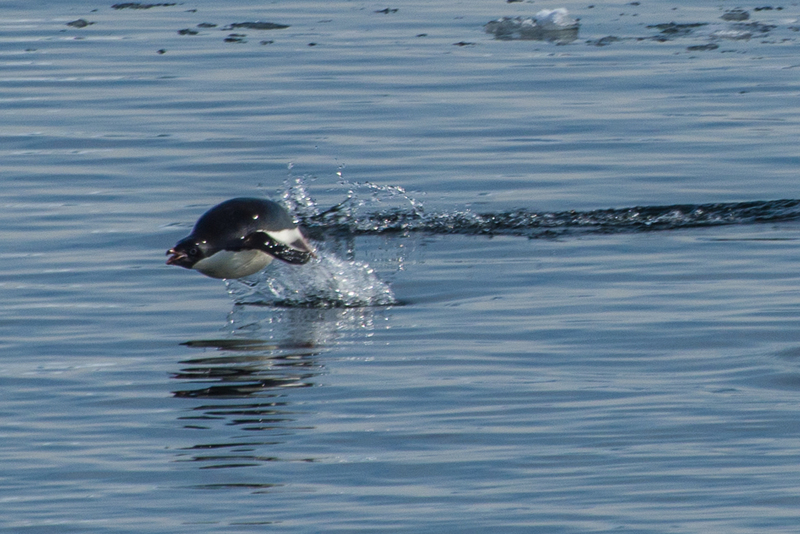 Catching air: this penguin leaped pretty high. 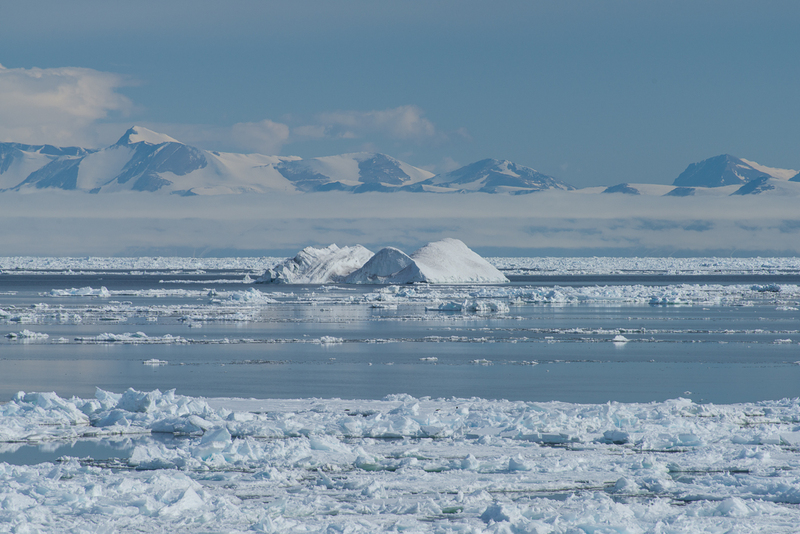 Iceberg that suddenly appeared at Cape Royds. 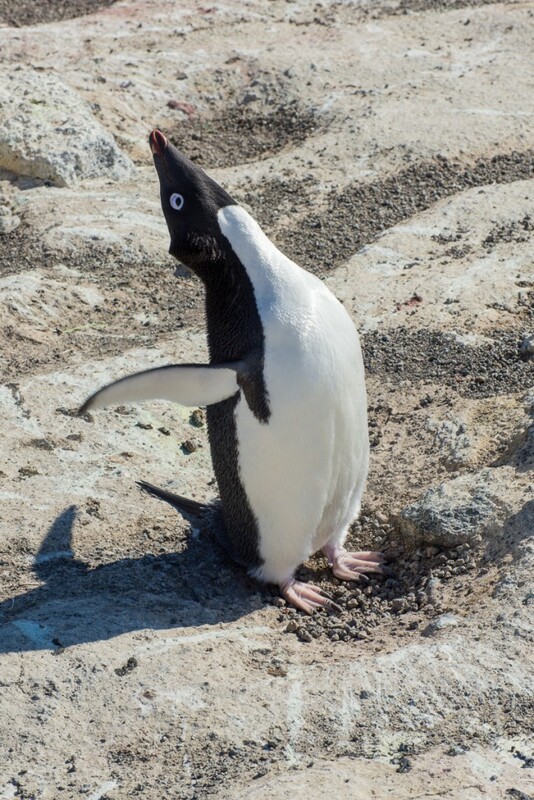 I tracked a penguin with my camera as he ran up a steep hill with a rock in his beak, which he presented to his mate in the subcolony at the top of the hill. There was an enthusiastic greeting between them. The landscape is rocky, he’s carrying a rock and something about the whole triumphant climb reminded me of the scene in the movie “Rocky” where Sylvester Stallone runs to the top of the long flight of steps at the Philadelphia Museum of Art. So I titled the video “Rocky.” Watch it on YouTube. 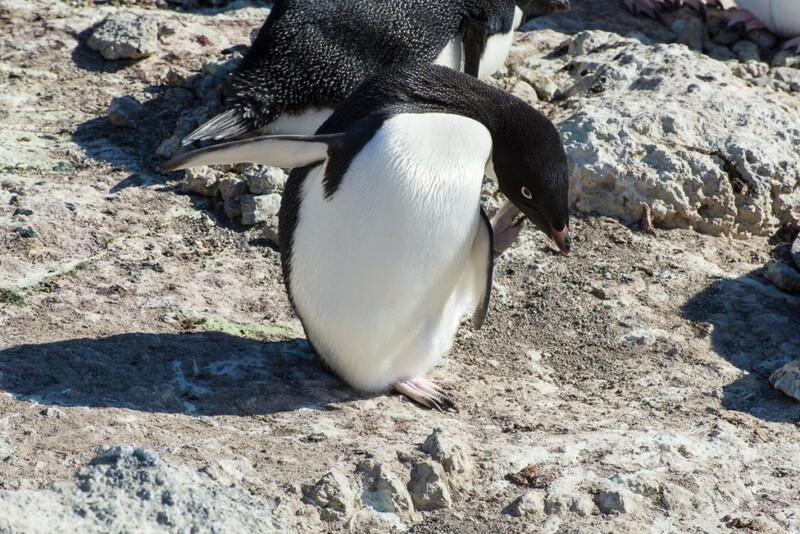 Don’t be fooled by the rocks that I got: this penguin is probably too young to mate and is just practicing nest building. 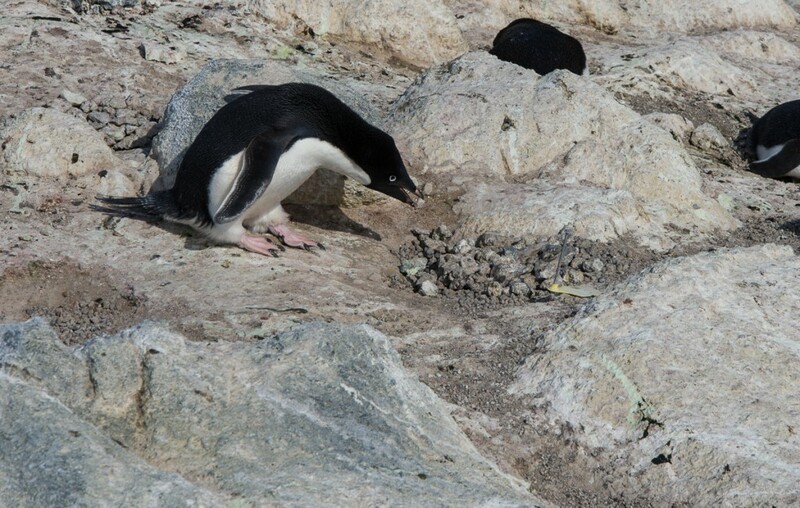 Young penguins three to five years old play at nest building, picking up stones and dropping them in a pile. Sometimes they even pair up, and do the whole greeting and changing places routine, but they are too young to breed and don’t lay eggs. 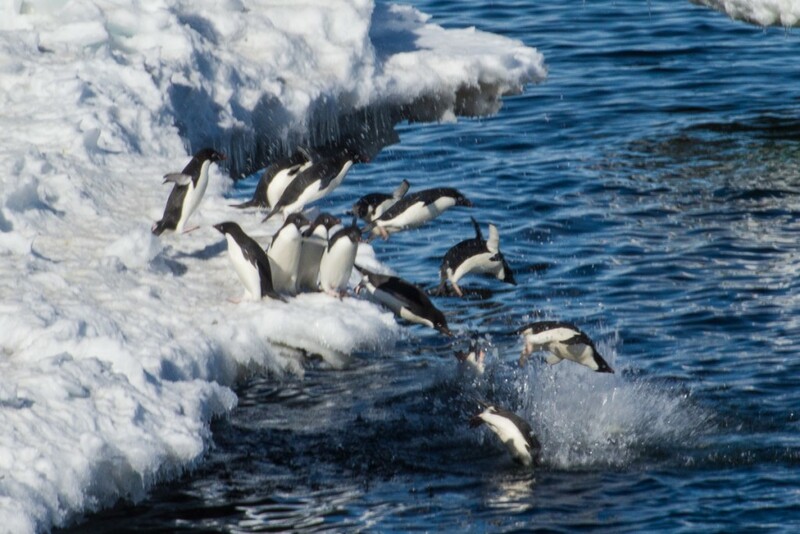 Sometimes they make a nuisance of themselves and other penguins chase them away. I saw one in that situation running away who stumbled and slid about 8 feet down a slope on its belly. 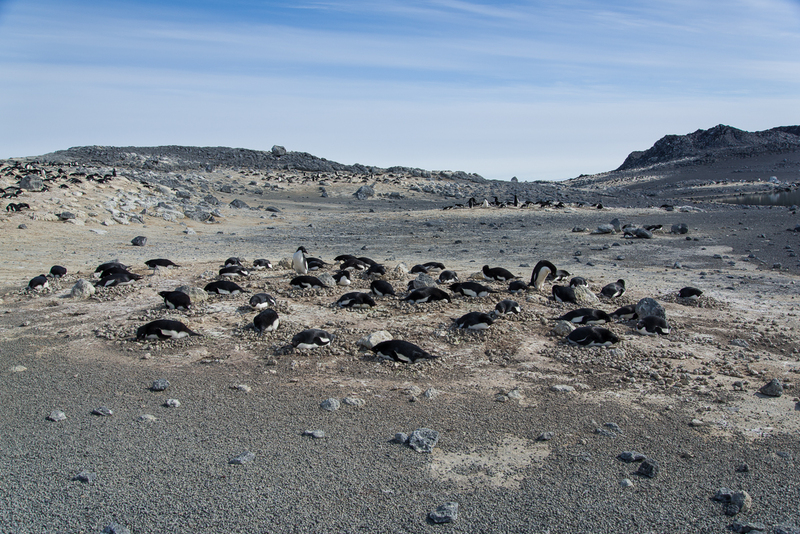 The only predator the penguins have to watch out for at Cape Royds, aside from orcas in the water, are skuas, who look for an opportune moment to steal eggs. I saw skuas swoop down and harass the penguins numerous times, but most of the time, the penguins are onto them, and squawk and lean toward them menacingly. 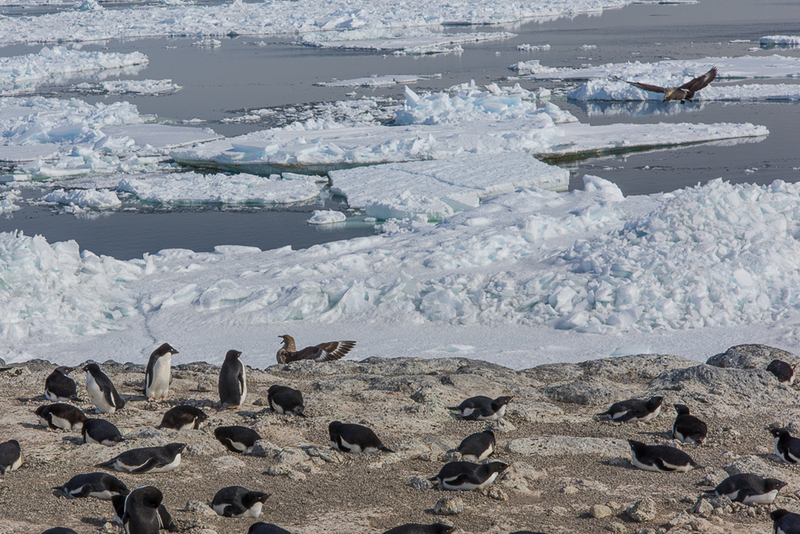 The skuas may stand there for a while, but once they know they can’t catch the penguins unaware they tend to fly off. 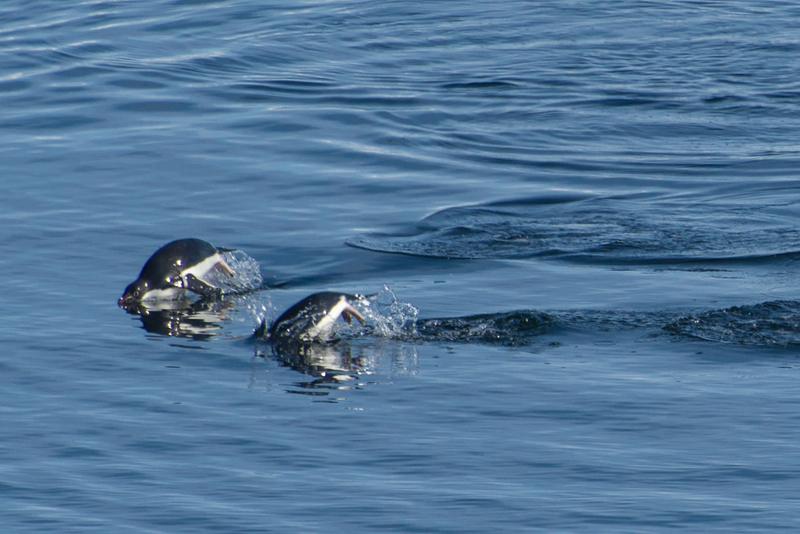 These skuas harassed the penguins to try to get at their eggs, but the penguins were having none of it. 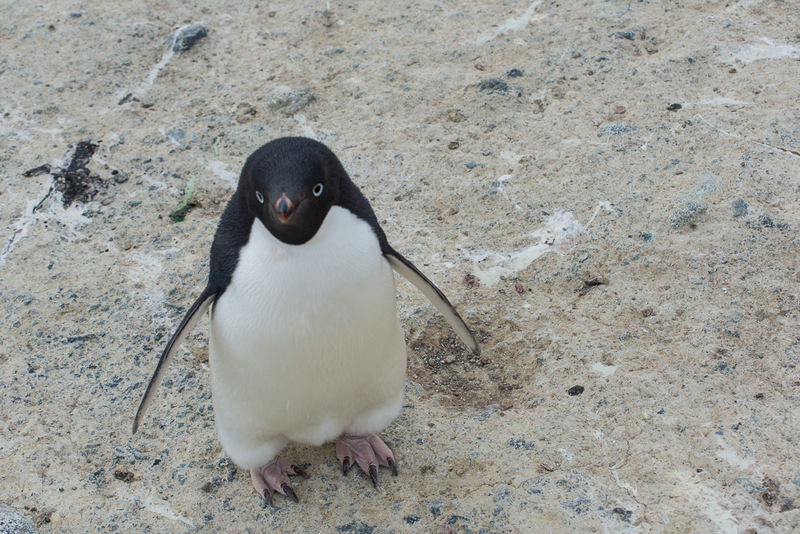 A curious penguin checks me out. 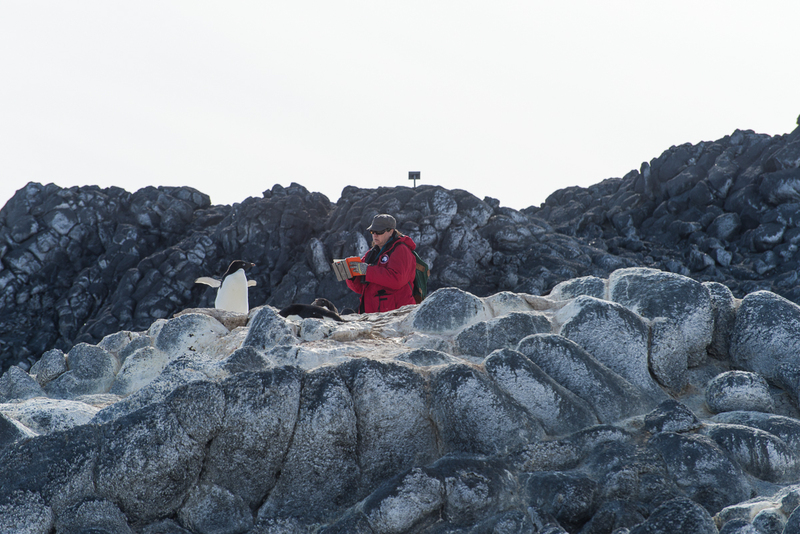 While I was there, Katie was making rounds every other day to check on the banded birds, making notes on the which ones were nesting and how many eggs they had. She has found that although the colony population hasn’t changed since last year, there are fewer nests and fewer eggs. Some nests were created but abandoned. Some pairs made nests but didn’t produce eggs and are just “playing house” as Katie put it. 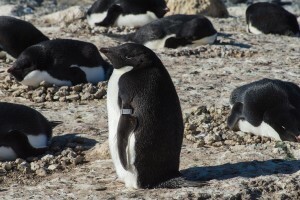 The scientists don’t know the cause of the lack of breeders, but one hypothesis is that something happened during the wintering over period that is making them struggle now. Katie makes the rounds checking on banded birds, nests and eggs. The colony at Royds took a major hit when an immense iceberg named B-15 broke off the Ross Ice Shelf and essentially iced in a huge area of McMurdo Sound year round, preventing the sea ice from breaking up in the Antarctic summer. After it broke up in 2005, the colony began to slowly recover, but it has still not achieved its original size, even though there should be enough krill and silverfish for them to eat. 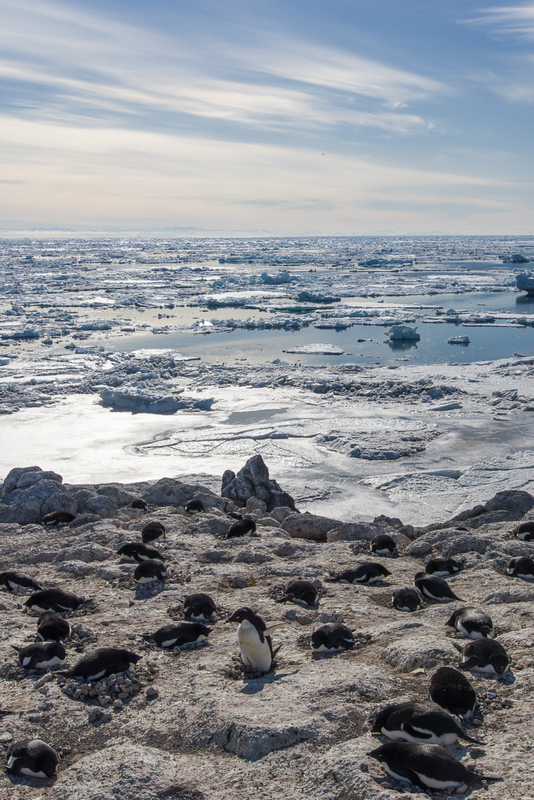 You can see that when you look at an overview of the colony and see all the empty spaces that are tan in color where penguins used to nest. 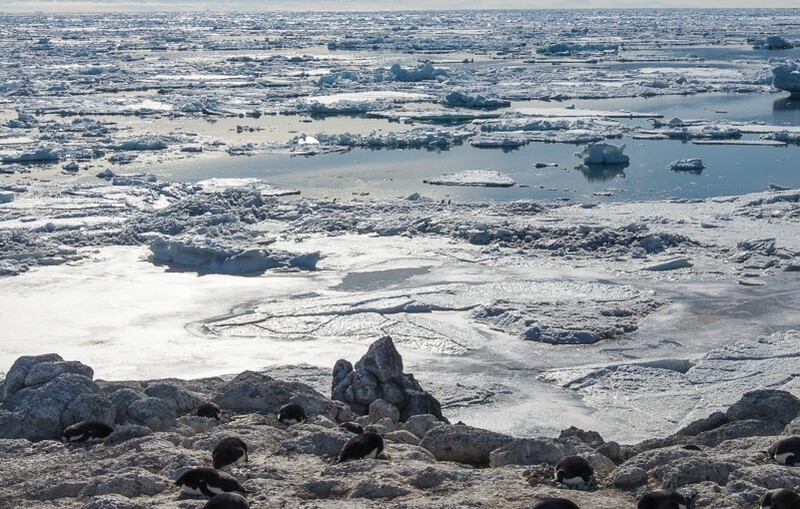 More research is needed to understand what is happening in the wintering over period and to look at some of the environmental variables that could be affecting their ability to survive and breed.